PocketBook CoverReader is a brand new unique device. A thin and light flip cover for smartphones with an integrated E Ink display first shown at IFA 2013 in Berlin! PocketBook CoverReader is the perfect mix of style, protection and additional reading features for your smartphone. Reading on smartphones now becomes comfortable for eyes with a daylight readable integrated E Ink screen. Thin, light-weight PocketBook CoverReader suites your palm perfectly and do not add much size and weight to your Galaxy S4. Change pages with the volume key or touch zones on PocketBook Cover Reader’s screen. Keeping your mobile charged while on the go is essential because no one wants to be left with a dying battery. Use your PocketBook CoverReader dealing with any sort of documents to stay on-line much longer due to the power-saving E Ink technology. 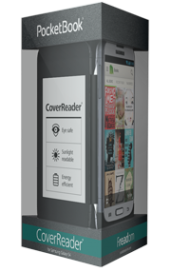 PocketBook CoverReader, easily mounted on the smartphone, allows reading favorite books as well as looking through the documents, e-mails or web-articles. E Ink screen also displays missed calls and SMSs received. The new flip cover connects to a PocketBook Reader app on the phone, where you store your e-books. 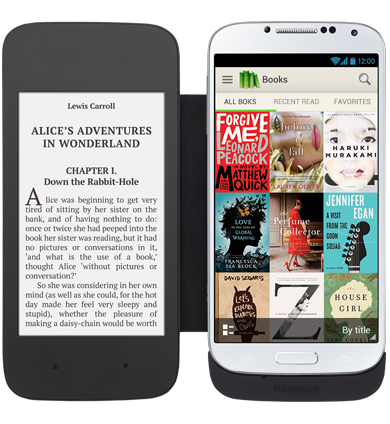 One can take an e-book as any other text or graphic file stored on the phone and send it to the E Ink screen using any app which supports Share feature.